Very cool. We use these for all of our clients, nice to see that it’s becoming a standard. Are you aware that Safari 5 on Mac can’t display your site? My browser goes into some kind of infinite refresh loop when I try to load it. We just recently found out about this Dave, but thanks for reporting it. If you enable third-party cookies in your preferences then it won’t do that. The issue relates to the way we’re currently doing “single-sign on” with your WordPress.com account (which is connected to Gravatar accounts). We should have it fixed up soon though. Actually I managed to make the problem go away without doing that. Not sure what I did anymore; perhaps cleared cookies and/or cache. I was wondering if it might be possible to have Gravatars with a rating of PG and above default back to a different ‘primary’ G-rated Gravatar. We’re implementing Gravatars at my work and we have both internal and more ‘public-facing’ sites, all on the same domain. I have a PG Gravatar I’d like to associate with that email address, but on our public sites (which we lock down to G ratings) it appears as the default Gravatar logo. It would be sweet if it could show my other, G-rated Gravatar instead. I know there’s a better way to request this information, but I’m not sure where! 🙂 Can Gravatar add a “Google Voice” # field for profiles? I don’t want to designate my # as Home or Work since my Google Voice is my primary catch-all…. My hovercard keeps linking to my old site. How can I change this? The link that’s applied to your Gravatar will usually be whatever you entered at the time you posted your comment, so that is not controlled by Gravatar (or your hovercard). 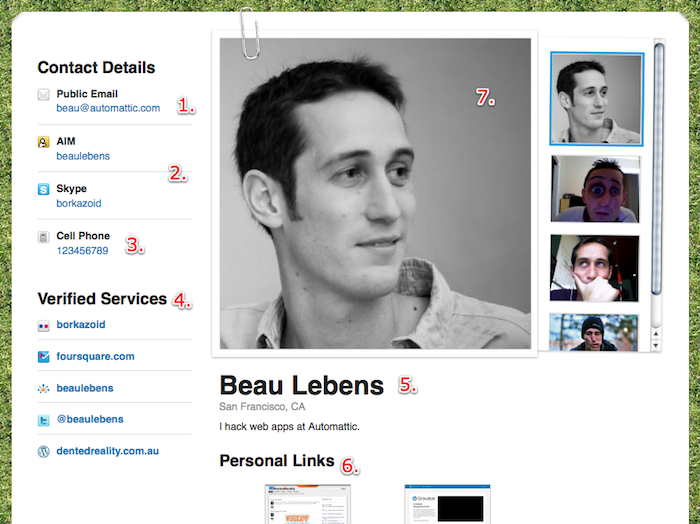 The links *inside* your hovercard should go to your profile on Gravatar.com, or to the specific sites you link to.